It's October 8th, and we all know what that means . . . the beginning of the most chromatophore-rific, jet-tacular time of the year! It's time to sing "Hearts of Three, They're For Me"* and bake suction-cupcakes. 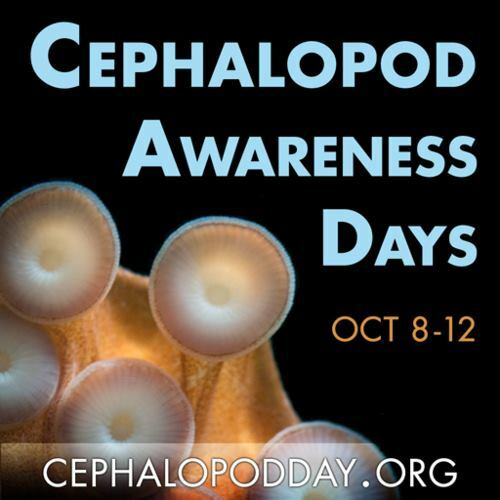 That's right, it's Octopus Day--the first of the annual Cephalopod Awareness Days! My book Squid Empire came out just in time, and that's not a complete coincidence. To honor all the world's eight-armed species, today seems like a good day to elaborate on that story. Once upon a time, many years before Craigslist, my dad and I pored over pages and pages of pennysavers, looking for an affordable aquarium big enough to house an octopus. (Even the small species like a lot of space.) To raise the money for it, I sold the American Girl "Samantha" doll that I had saved up for years to buy--it felt like years, anyway, and I think it may in fact have been more than twelve months. I recall no regrets. We ended up with a sixty-gallon aquarium and there wasn't room for much else in my bedroom once it was installed. Fortunately I had a loft bed, or it never would have fit. Everything that I did squeeze around the tank--bookshelves, desk, dresser--sooner or later became encrusted with salt. I started with a couple of hardy blue damselfish to cycle the tank and make sure it was habitable before bringing home a precious, precious octopus. I wasn't especially partial to the fish, but I did have a weakness for any living thing that came under my care, so I gave them names and talked to them. And then the time came to introduce them to my first octopus, Serendipity. 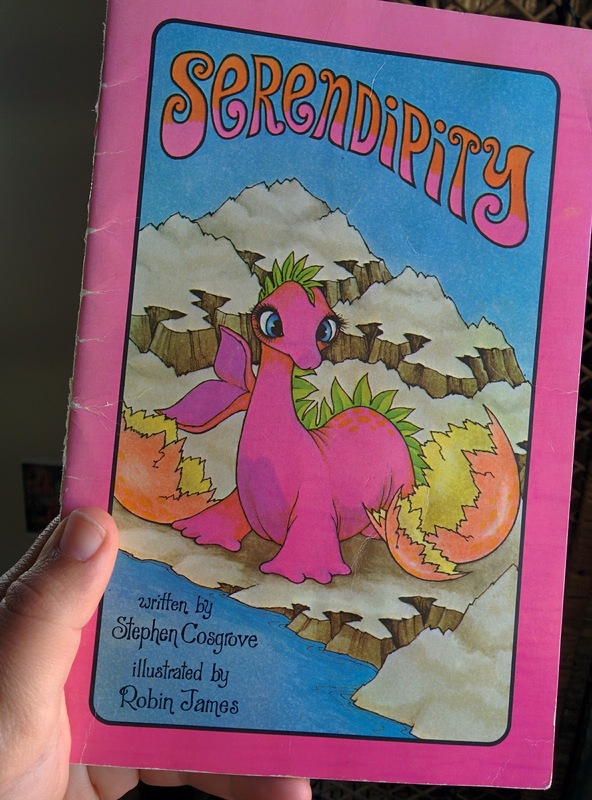 I still have my childhood copy of this book. I named Serendipity after my favorite literary sea monster. I was pretty sure that she was a girl because I could never see a hectocotylized arm, though I was also aware that its invisibility was no guarantee of its absence. I fed Serendipity cubes of frozen brine shrimp, which I kept in the kitchen freezer--the only "meat" in our vegetarian household. I would pop out these tiny cubes one at a time and lower them into the water until most of my arm was submerged, cautiously approaching Serendipity's lair. I thrilled at the sensation when her arms caressed my fingers, curling and tickling as she took the crustacean cube. Her arm web enclosed the food, but through her skin you could still see its clear outline as her little beak gnawed away at it. She usually accepted frozen food, but everyone says that octopuses prefer live prey and it didn't take Serendipity long to find some of her own. Shortly after the demise of the damselfish, I discovered my darling octopus sitting inside the empty shell of one of the snails I had bought for cleaning algae off the tank walls (and which, of course, I had also named and talked to). I see on the website LiveAquaria that "The peaceful Turbo Snail should not be kept with aggressive tankmates that can quickly overcome this slow-moving creature." Indeed. Maybe I forgave Serendipity her carnivorous ways in part because I knew that her own brief candle would soon be out, out. She lived with me for about a year, maybe less. My memory of her death is discovering her body at the bottom of the aquarium, arms curled up, rocking lifelessly in the current. I cried far more for her than I had for the fish and snails she devoured. My local fish store provided a replacement, and I thought I saw some enlarged suckers on this one so I named him Rex. Actually, I'm not sure I was capable of giving such a simple, straightforward name to anything--I think Rex was probably an abbreviation for something. Anyway, Rex ate brine shrimp cubes, too, and this time I didn't stock his larder with delicious tankmates. But Rex was my last pet octopus. When he died, I decided I was through with the heartache of such short-lived pets. Over the ensuing years I moved on to more perennial species: anemones, seahorses, and most memorably a pufferfish named Agnes. She was perhaps the closest I ever got to that puppy I asked for every Christmas. Eventually Agnes came to college with me, and woke me every morning by splashing loudly for breakfast. She even has a cameo in Squid Empire, page 150. Sadly, I don't have pictures of my childhood octopuses. They lived in the pre-digital days, and I wasn't much of a photographer anyway. 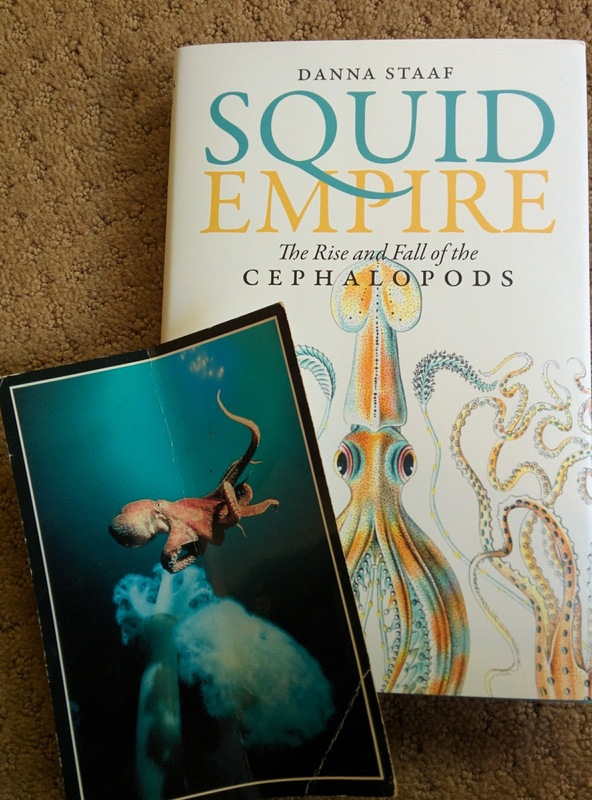 But I do still have the octopus postcard that my parents bought for me at that fateful visit to the Monterey Bay Aquarium. Although the octopuses both large and small who first awoke my lifelong passion are long gone, their inspiration endures. Thank you, my eight-armed friends. * Y'know, because cephalopods have three hearts: two branchial hearts that pump blood to each gill plus a systemic heart that pumps blood to the rest of the body. I haven't yet written the words to this song, though. The "patient father" must confess to feeling responsible for Serendipity's demise. All the water in an ocean-water tank must be recycled periodically and I always have felt I performed that task too quickly the last time. I know she wouldn't have lived much longer regardless. In any case we celebrate the week! Oh gosh, I'd forgotten about that! Cycling the water was an enormous chore, and you were a magnificent aquarium-keeping partner. Serendipity certainly had a long and lovely tenure with us. Just discovered your blog and plan to buy your book!